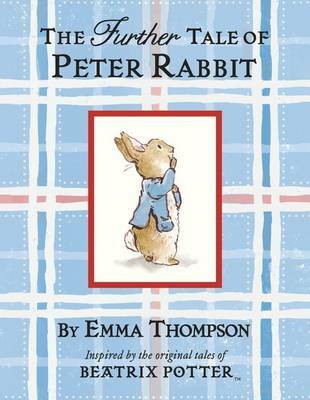 In "The Further Tale of Peter Rabbit", a new tale written by Emma Thompson, Peter's adventures take him beyond the boundaries of Mr McGregor's garden all the way to Scotland. Here he meets the gentle giant Finlay McBurney, a distant Scottish relative, and much entertainment ensues. Emma Thompson, Oscar-winning actress and screen writer, is a long time admirer of Beatrix Potter's tales. She has a talent for creating engaging narratives with a dry humour similar to Potter's own and is the perfect choice of author for this new Peter Rabbit tale, to be published 110 years after the original. Emma was inspired to set the tale in Scotland by her knowledge of Beatrix's childhood holidays there.